After eating at El Chubasco we drove back to Salt Lake by going up and over Guardsman’s Pass into Big Cottonwood Canyon. This little guy – not more than seven feet tall or so – was holding up traffic. This is so Utah. I saw a few moosen in Vermont when we lived there. 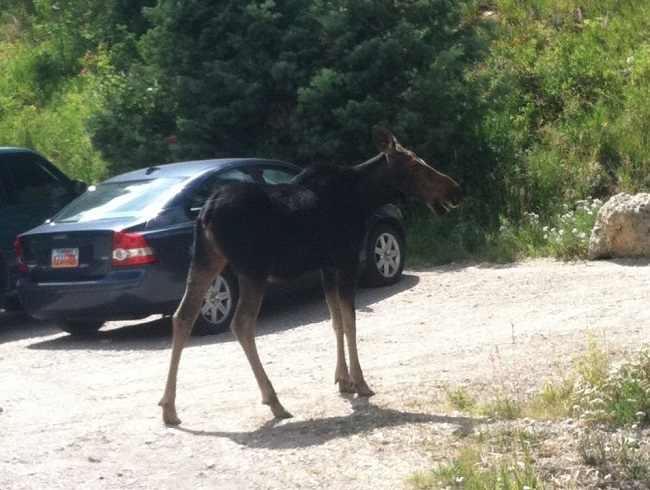 There are moose that have been reintroduced in the Silverton area, but we’ve never seen one. But I’ve had all kinds of moose encounters in the Wasatch and Uintah mountain ranges. There seem to be a surplus of the big guys there. On Sunday, we drove up to Mirror Lake in the Uintahs. It was impressive as always, but it was rainy. But it didn’t seem to dampen my spirits any; just knowing that I was near Ruth Lake gave me the grins. Now it’s a Tuesday. I’ve set my start date to work for September 3rd; we’re leaving on Friday for two weeks with friends on Isla Mujeres in the Caribbean. That means that I have only three days left in Utah (this time around). Yes, the Caribbean is wonderful and I love Isla Mujeres. But I am in no hurry to leave Utah just yet. What happens if it goes away while I’m gone? It is refreshing too hear you happy. I hope your new job is the icing on the cake.